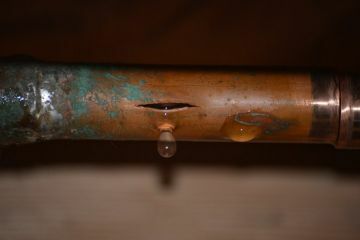 Have you experienced a burst pipe in your Blue Springs residence or business? Act quickly! Water damage from burst pipes will get very expensive very rapidly. First, shut off your water at it's source. Next, call Kevin Ginnings Plumbing Service Inc.. The faster your response, the lower the cost of water damage sustained. Kevin Ginnings Plumbing Service Inc. has worked with home owners and business owners in Blue Springs with leaking pipes or burst pipes to contain the damage and quickly fix them. Burst Pipe in Blue Springs, Missouri? If you have experienced a burst pipe in your building, call the expert plumbers at Kevin Ginnings Plumbing Service Inc. today. We have been repairing burst pipes in Blue Springs since 1985 and ready to assist you as well. When you call (816) 832-4322 for a free quote to fix your burst pipe, you'll receive prompt service and a quick quote. The longer it takes to contain the leaking water, the greater the damages. Call Kevin Ginnings Plumbing Service Inc. ASAP to fix your burst pipes!